Before I dive into the recap, let me first thank those of you who commented here on the blog, on Facebook and Twitter, and sent me individual e-mails providing support in regards to my corral mishap. Its clear that CUCB was inconsistent in their corral placements this year, and those that did try to have their corral placements corrected were unsuccessful in their attempts. I truly hope that the Race Directors rectify this problem, as well as several others, going forward. Preston and I had set our alarm for 4:30am. Unfortunately, our alarm never went off, but fortunately I woke up around 4:45am needing to use the bathroom. Only fifteen minutes lost, not a huge deal, especially since we had laid out our race clothes the night before. I did make a last minute decision to switch from running tights to capris, but otherwise everything else was already out and ready to go. Since I wanted to get into the corral as soon as possible, our goal had been to leave our apartment by 5:30am. We wound up leaving closer to 5:45, drove into Clarendon, parked, and made our way onto the Metro. However, just before we were about to get on the train Preston asked me where my hydration belt was, I realized that I had left it in the car, and while Preston ran back up to the car to retrieve it we missed one train. We had to wait another 18 minutes for the next train (gotta love Metro on the weekends), but we finally made it to the Smithsonian stop just around 6:45am. 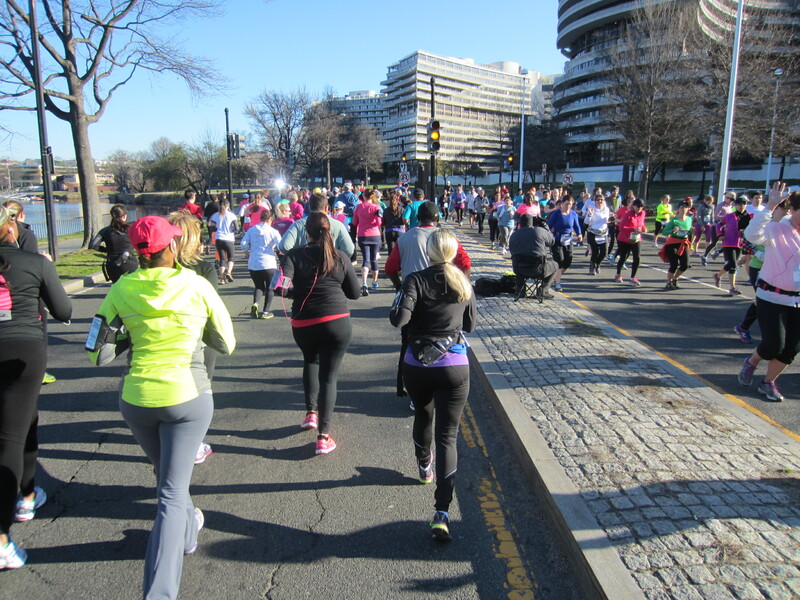 We quickly made our way towards the Washington Monument, where the staging area for the race was. Preston and I checked our bags, he headed off to the Team Red, White & Blue meetup, and I stood in line for the porta potties. I had also planned to go to the prerace meetup, but given that I wanted to get as close to the front of the corral as possible I opted to pass. As I made my way over to the corrals, I realized that my corral, the Purple Corral, was fairly empty, and there was only 15 minutes until the race was to start. I found this a bit odd, but a few minutes later realized why – the corrals weren’t being enforced! I entered the corral, and quickly found Jenny from Run Jenny Run. It was fun to be able to meet her in person, and the time between the start of the race and when our corral started passed by very quickly as we chatted about our upcoming races. Shortly after the race started I spotted numerous Purple Corral bibs up ahead in the Green Corral, but at that point it was pretty much impossible for Jenny and I to move, as the corrals were now tightly packed. It was clear that the corrals weren’t being enforced whatsoever. The race started at 7:30am. I took my first Gu Energy Gel of the morning while I waited for my turn to cross the Start Line, which I finally crossed at 7:55am. The first mile of the race was very packed. As with past races, I knew I wouldn’t be able to safely start my run-walk intervals until several minutes into the race. After eight minutes of not completing a single walk interval because of how packed the course was, I made my way as far to the side of the course as I could. Although I had yet to be able to run at a pace I’d trained for, I knew that I needed to run the race the way I’d trained, and that meant using run-walk intervals. The first several miles of the course were very similar to the first couple of miles of the Rock ‘n’ Roll USA course. 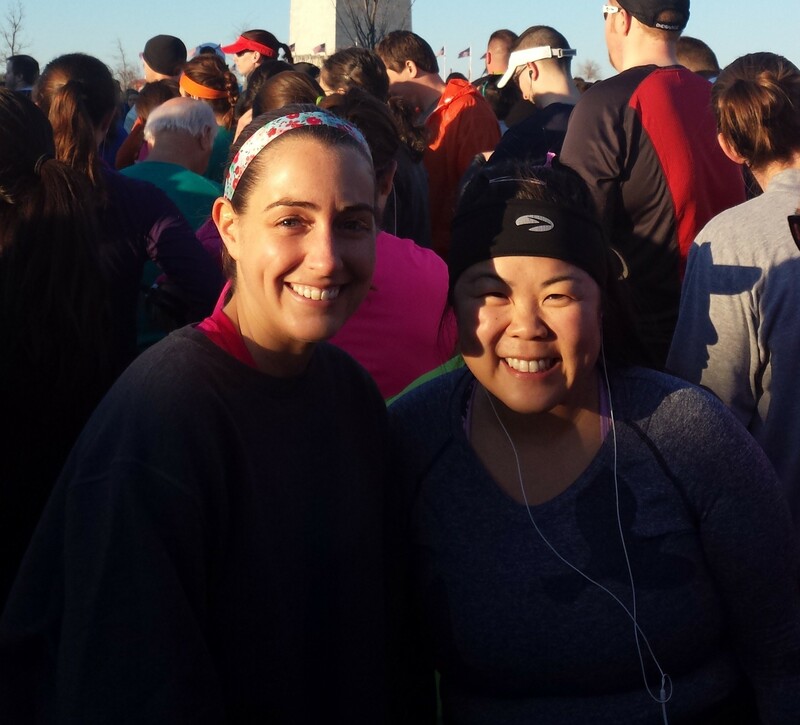 We ran towards the Lincoln Memorial, crossed Memorial Bridge, circled in front of Arlington National Cemetery, ran back across the bridge, and then headed down towards the Kennedy Center. Just past the Kennedy Center we encountered our first hairpin turn of the course and headed back towards the monuments. It wasn’t until we passed the 5k mark and were headed back towards the monuments that the crowd finally thinned out enough that I could get into a good run-walk rhythm. Had I not been in the wrong corral and/or the course not been as crowded, I believe I could have shaved at least a minute or two off of my 5k split. Alas, it was what it was, but I was finally happy to be in a good mindset and rhythm as I ran around the Tidal Basin on Ohio Drive and Independence Avenue. About forty minutes into the race I took another Gu and continued on my way. The further I ran, the less frustrated I became about the race. 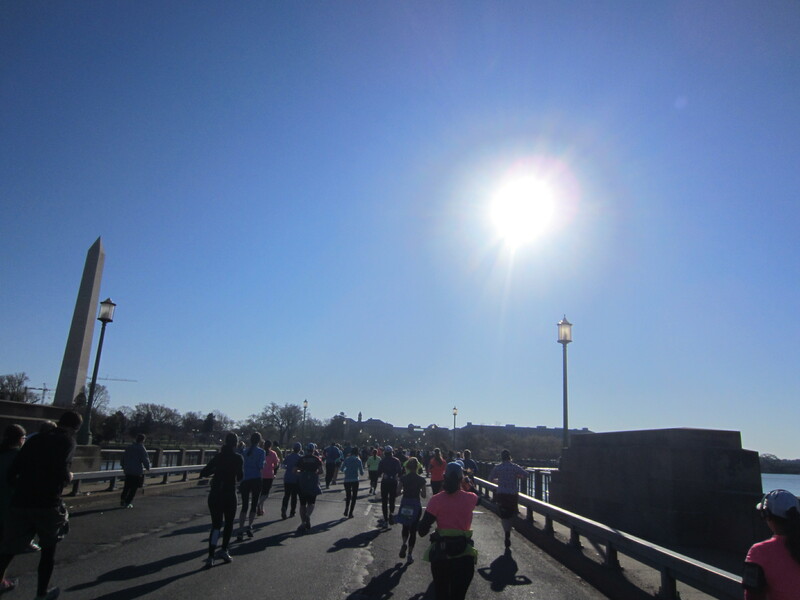 Ironically, the sun was also shining brighter the further that I ran, and I can’t help but think that the sun’s presence helped to further ease my frustration from how crowded the course had been early on. It was an absolutely gorgeous day for a race! The crowd support during the first six miles of the race was incredible. They definitely helped to ease my frustration from the course weaving and slower runners that I had been surrounded by. 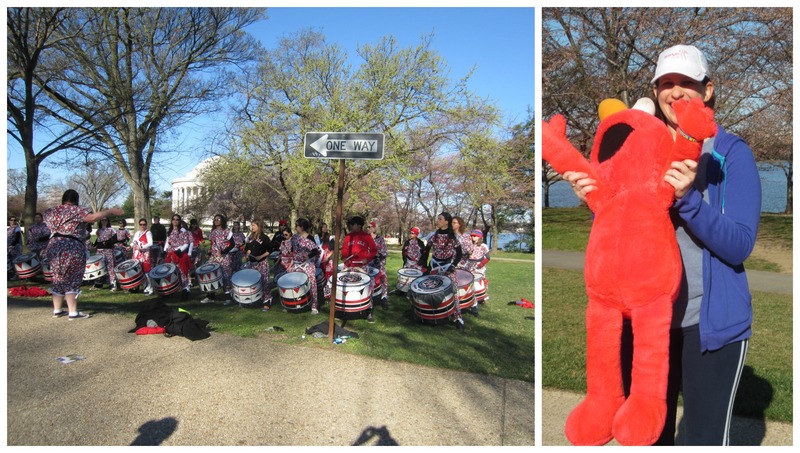 As we headed towards East Potomac Park I encountered one spectator who was cheering everybody on with an Elmo doll. She was by far my favorite spectator of the entire race. As we entered East Potomac Park we passed the Brazilian drumline, and hearing their music not only brought a smile to my face but gave me the adrenaline rush I needed as I made my way towards Hain’s Point. Miles 7-9 were by far the most boring of the entire race. As we made our way closer and closer to Hain’s Point the spectators decreased dramatically, but these miles of the course were also the flattest. Around the 1:20 point, I took another Gu as well as ate a couple of Clif Shot Bloks. These gave me just the energy I needed as I made my way back towards the Washington Monument, where the finish line of the race was. The most challenging part of the course was during the last quarter mile, where we encountered the most difficult “hill” of the course. I use the word hill loosely, as this course was one of the flattest that I’ve run, and nothing quite compares to Calvert Hill at the mile 6 point of the Rock ‘n’ Roll USA course. 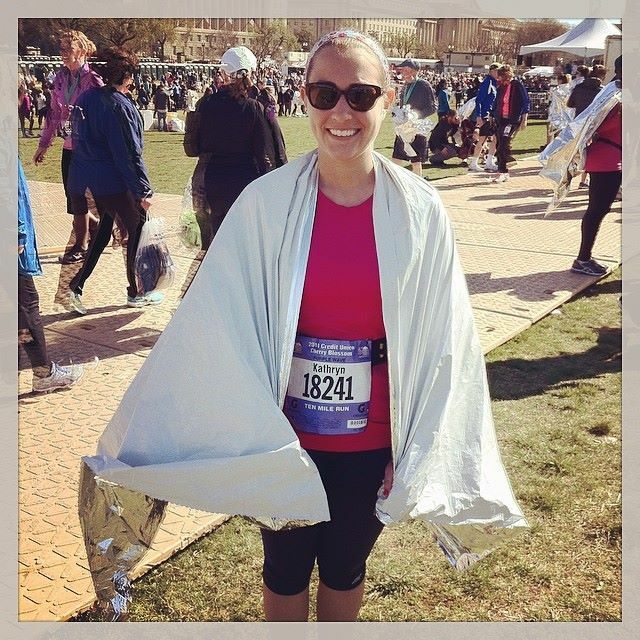 As I made my way closer and closer to the finish line I knew that I’d finish in under two hours and meet my C goal. My official finish time was 1:58:44. Although I was disappointed that I had been unable to meet either my A or B goals, I was proud of what I’d accomplished, especially given how crowded the course had been during the first three miles of the race. This was also my first ten mile race, which also means I PRed! I’m proud of the fact that other than walking through the water stations I maintained 3:1 run-walk intervals for the entire race, and didn’t stop once to use a porta potty like I have during both of my half marathons. As I made my way past the finish line, I quickly spotted Preston on the side of the course. I made my way to retrieve a heatsheet as well as water, and then made my way to him. What I found odd about the finish area of this race was that it wasn’t secure and that I had to dodge spectators. What I also found odd was that the food area was completely unsecure, which I’m sure was the biggest reason why when I finished that the only food left was bananas. When Preston had finished, there had also been granola, chips, and Lara Bars, but those were nowhere to be found. I heard from many people that spectators had just been helping themselves to the food. Excuse me, but isn’t the food meant to help the runners with post race recovery, not serve as a snack for spectators? I will say, Preston didn’t run this race for time, and had a much different race experience than I did. He ran with Team Red, White & Blue (they started in the Blue Corral), and carried the American flag for several miles. There was plenty of food when he finished the race, and the finish area was nowhere near as crowded as it was when I finished. Maybe this race is better targeted toward faster runners only, or those who aren’t concerned about their finish time? After the race, I got to meet Christine from We Run Disney, who was volunteering at the awards area. Funny story – she and Preston had met inside the race retreat tent after the Disney World Marathon, and then Preston saw Christine and her mom in passing in Adventureland on our last day at Disney World, but it wasn’t until this race that I finally got to meet Christine in person. I also got to see Cyanne from Run Stretch Go again, who I had met at the expo on Friday. As we headed back towards the Metro, I was on a runner’s high from my race accomplishment as well as having had the opportunity to meet several bloggers during the weekend. My feelings about the race itself were very mixed though. Will I consider running this race again in the future? I did love how flat the course was, and for that reason alone I would consider running this race again. However, I won’t be going out of my way to make it work with other events on my calendar and if I happen not to get into the lottery in the future it might just be a sign that I’m not meant to run this race again. 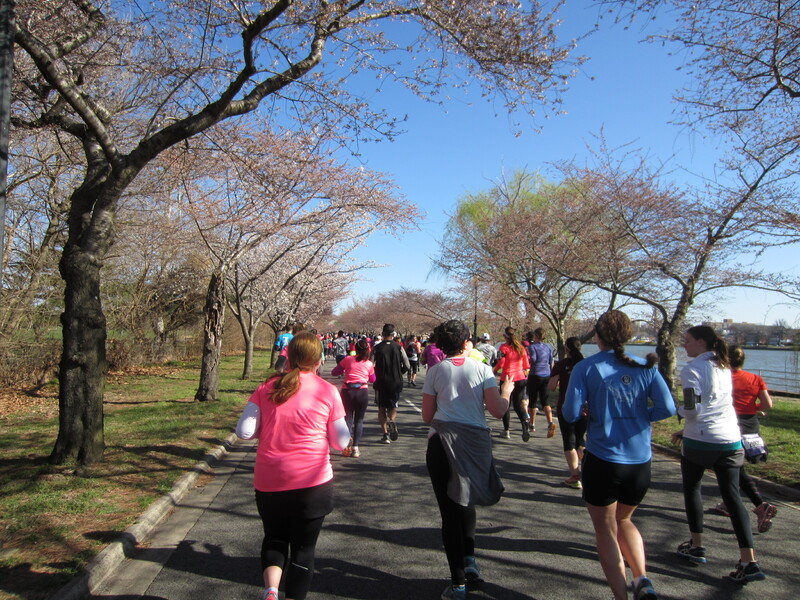 QOTD: If you ran the Cherry Blossom Ten Mile Run what are your thoughts on the race? Did you have a similar experience like I did, or a completely difference experience? 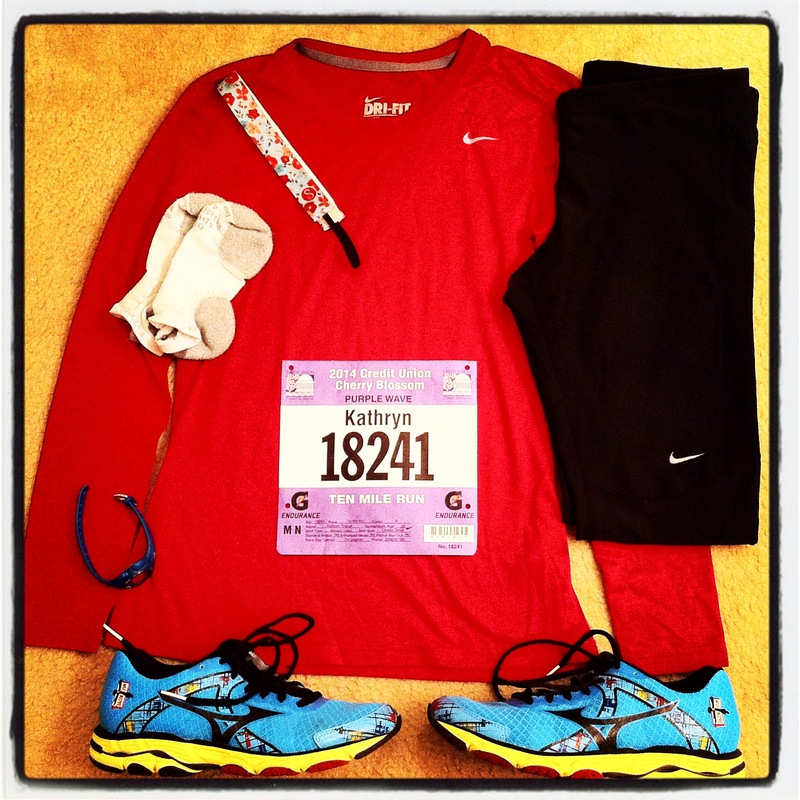 This entry was posted in Milestones, Races and tagged bloggers, Cherry Blossom Ten Mile Run, Clif Shot Bloks, GU Energy Gel, milestone, personal record, run-walk-run method, running, Team Red White and Blue, ten miler. Bookmark the permalink. To be totally honest, I’m not all that excited about running this race after hearing about the running experience and my volunteer experience. I’m sure I will and just not have expectations for a fast race. I’m really surprised the finish wasn’t more secure a) after Boston and b) since it’s in DC! I couldn’t agree more, Christine. Thanks Lauren. I’m not saying that I’ll never run this race again, but definitely won’t be going out of my way to make it possible either. Great photos, it looks like at least it was a scenic (and flat) route, which is cool. Though the crowds sound hard to deal with 😦 I’m glad it ended up being a decent race experience. I hope they fix some of the negatives in the future. It was a very scenic route, which with it being a flat scenic route was definitely the highlight of this race for me! Good for you for meeting one of your goals! I can not believe that the finishers medal was an additional cost! How crazy is that? So cool that you got to see the girls! Thanks Meranda! Seeing the girls was definitely one of the highlights of the race. Yikes! You ran an awesome race, and it looks like a fabulous course and a beautiful day, but I’ve definitely heard about the crowds on this course…so to not enforce corrals just doesn’t seem all that intelligent, right?! Crazy! I had been thinking about coming back to DC for this race sometime, but I really appreciate your honest review…maybe I’ll skip it. Races that run out of food is also a pet peeve of mine, that’s for sure! Its unfortunate that so many races don’t have enough food on hand for all runners. Slower runners are just as deserving as in just as much of a need for post race recovery as faster runners are. Great job on your race! It looks like it was a beautiful day! There is always pro and cons in most races. But after reading several blogs about this weekend, It sounds like the cons out weight the pros. Agree about there being way too many runners and having had to practically walk for the first three miles. And not only wasn’t food secure, it was really difficult to find the food and more importantly, the post-race water as there was absolutely no signage indicating where they were located. I really didn’t have a problem with the water stops..after doing the Philly Marathon in 2011 where they inexcusably ran out of cups at some of the stops, anything is an improvement. Also, saw some people wearing cute headbands with the 2 springs on top and cherry blossoms on top of the springs. Would love to get some for next year but live in NJ and can’t find them online. Any idea where to buy them? I know which headbands you’re referring to, Nancy. I saw several people in the corral wearing them. Unfortunately, I don’t know where online they can be purchased, but if I find out I’ll be sure to let you know. I did find them Kathryn, thanks. Hate your experience wasn’t that great with this race. I’m surprised it wasn’t more secure since it is in DC! But it looked like the course was awesome! 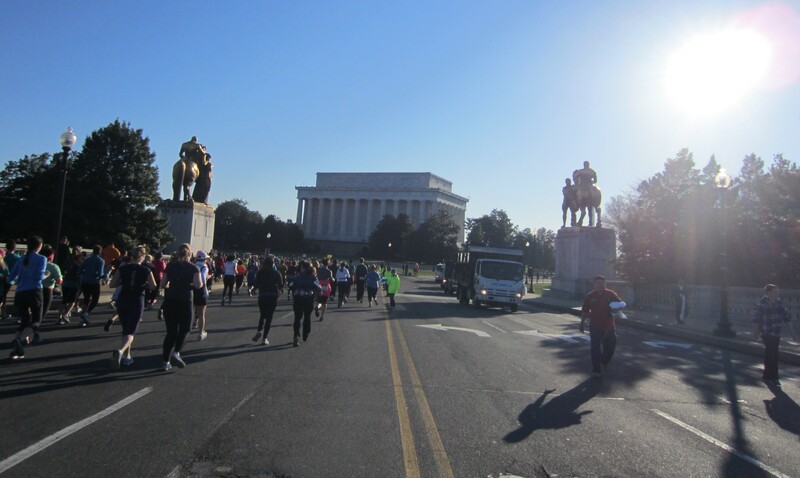 How cool to run by all the monuments! The course itself was absolutely perfect – flat and scenic. What else in a course could you possibly ask for? Great job on your race! And I am happy to hear DC is flat! That will make my half in a few weeks much more enjoyable. And I love your shoes! Thanks Lauren! 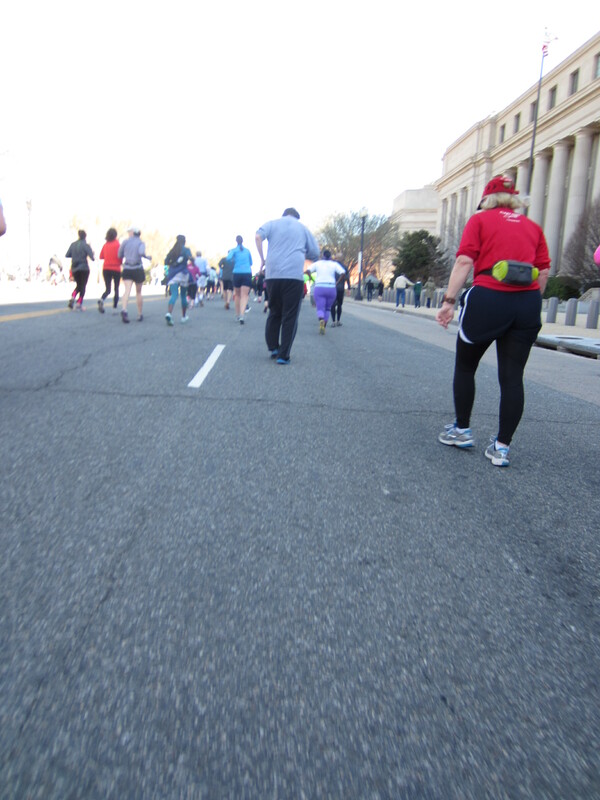 Not sure what the Nike Women’s Half course is, but parts of DC (particularly by the monuments) is very flat, but when I ran Rock ‘n’ Roll USA back in March is was anything but flat. Just depends on the parts of DC that are included in the course. Just out of curiosity, how much more did they want to charge you for the medal and shirt?? $45 for a race with no extras seems like a bit much to me!! I think the medal was $13, and I’m not sure about the shirt. For DC races, Cherry Blossom is on the low end. Kathryn, sorry you didn’t get placed in the right corral. I really agree with you about the race disorganization. I thought even the sign-up process was disorganized. For someone who’d never signed up for race by lottery before, I didn’t feel like the website made the steps clear to a newbie at all. 1) Why were there only eight port-o-potties close to the Smithsonian Metro, but 100 on the main staging area? Why not spread them out a little more? 2) Why weren’t signs telling you about upcoming water stops consistently placed on the same side of the road as the water stop? 3) Why weren’t spectators kept out of the finish line area? I expected when I finished that where to go for food and medals would be quite clearly marked. Well, actually, I thought someone would put the finisher’s medal around my neck within a 100 feet of the finish line. Who knew I’d have to walk all over the place to try and figure out where stuff was? Quite a letdown after running 10 miles. 4) Why were there so many places where the course doubled back? I know some doubling back is unavoidable, but they really seem to overdo it. 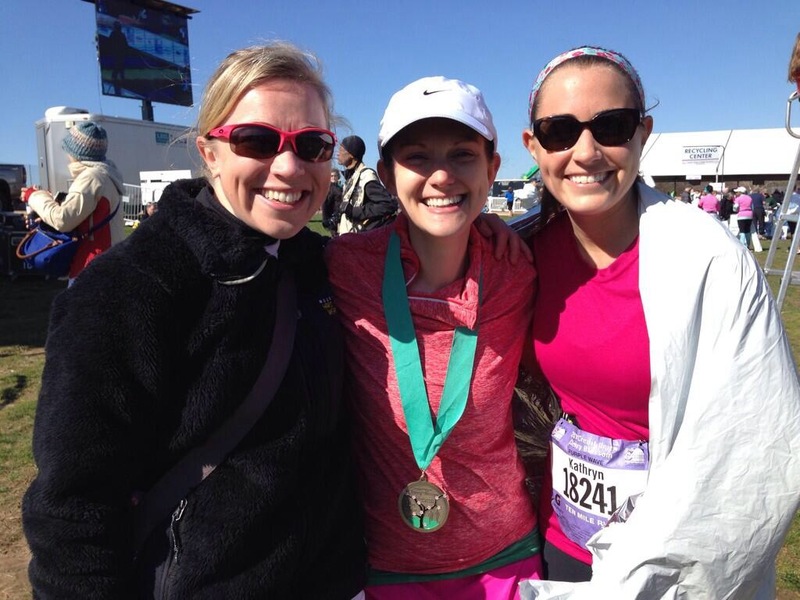 Until this year the longest race I’d ever run was my hometown 10K, the Azalea Trail Run. So much better organized and so much more fun than Cherry Blossom. Way more spectators, beautiful scenery, an almost totally flat course, and tons of post-race water, beer, and red beans and rice even for the back-of-the-packers like myself. And a lot cheaper, too. I won’t say that I’ll never run Cherry Blossom again, but it could have been so much better. I agree with everything, Kristen. The porta potty situation didn’t bother me all that much, and I forgot about the inconsistencies with the signs for water stops. The finish line area – that was just a disaster! The few Potomac River Running races that I’ve done have been so much better organized. CUCB could certainly learn a few lessons from them. I’m glad you ended up having a great race! I kind of want to run this in the future, but I’ll let them work the kinks out first! Congrats on beating your C goal! That’s a really great time! Thanks Kristen! Its surprising how many problems there were, given this was the 42nd year of the race. Since I live here its possible I could run it again, but I definitely won’t be going out of my way to make it work with other events on my calendar. I am happy you met your “C” goal despite the conditions! Your write up was really accurate (I forgot about the Elmo – he did bring a smile to my face!) and I wish the finish area was more secure. I am running the GW Parkway 10 Miler this weekend, perhaps an alternative for next year? Will let you know how that goes! I can’t wait to read your GW recap. I may have to consider this one instead next year. I found your blog through Run with Perseverance – the race is definitely very crowded and tough for a PR, in my opinion. I’m also not a fan of the limited post-race food, and didn’t think about the fact that non-runners are probably grabbing it too, which is why they run out. Great post! Its always good to know that I’m not alone in how I felt about this race. Unfortunately I think a lot of races give their slower runners the short end of the stick despite them running the same race and paying the same fee. It’s pretty inexcusable to me but it is definitely a common attitude, I had a similar experience at the Perfect 10 in Chicago in 2012 and while they did make amends when I reached out to them, I didn’t run it in 2013 and am not sure if I’ll run it again this year. Unless races want to start charging higher registration fees to faster runners then you’re right, all runners of all speeds deserve to be offered the same amenities, no matter how long it takes to finish the race (as long as they do so within the published course limit time). I thought that overall it was well organized, but the corrals at the start not being enforced made me a little crazy. Mostly because there were SPECTATORS in the corrals, which was highly inappropriate. And people walking in and out of the corrals at will. As for water – at every single water stop, the first couple of people were out of water, but at the end of the table there was a surplus. This is true for most races I’ve run. Spectators in the corrals? I didn’t see notice any but I wouldn’t be surprised either given how unsecure the start area was. As for the water stops, I found the volunteers at the early stops, even at the end of the table, to be scrambling to keep up with the number of runners coming through. Again, this is probably more a problem that slower runners experienced, as we were the last to make our way through the water stations. I haven’t had as big of an issue with water stops at other races like I did at CUCB.